Armed for war, Thanos wields the Infinity Gauntlet and plots to take over the galaxy. This figure, a Walmart exclusive, is a repaint of the Thanos Build-A-Figure from Avengers 2: Iron-Blooded Orphans Series 1. And since it's a repaint, it seems sufficient to give it a quick review here on the blog. The sculpt is identical to the existing figure, being very wide and stocky, with muscles that are more angular than organic - it's a way to suggest the armor he's wearing, not a hint that he's a robot. The difference comes in the paint, which is still a metallic blue, but is a slightly lighter shade here, to better match his classic comic appearance. The gold armor is lighter, too, and the silver on his legs is now matched by piping on the arms. His boots, rather than only having yellow at the tops, are one color all the way to the ground (with a lighter stripe painted on to match the highlights also present on his forearms and shoulders. 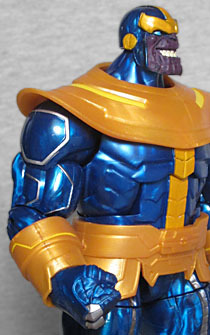 Thanos' skin is much darker on this toy than on the old version! I mean, sure, the BAF's face was perhaps too light, but there's a difference between steering into the skid and whipping the wheel around so hard you jackknife. This purple is verging on black! His blue eyes and his big white grin are the only things that don't blend into his costume! On the plus side, Hasbro's finally taken our advice and given this figure exactly what we asked for with the Fierce Fighters swap figures: an alternate head. We get one smiling and one frowning, thereby covering pretty much every appearance he's ever made in any comic. Nice stuff! But really, that isn't why most people will be buying this figure. His other accessory is an alternate left hand, and what does Thanos wear on his left hand? The Infinity Gauntlet. We haven't had an ML-scaled Infinity Gauntlet since 2008, so this is going to be a big draw. The hand pops out at the wrist, and you simply trade the armored bracer for the upper edge of his big glove. Voilà! The gems are all present in their proper slots, and the sculpt matches the classic look. 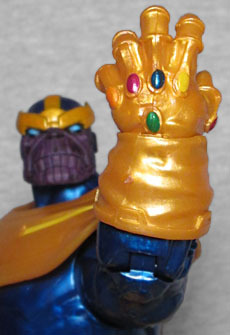 Now, technically, the original Infinity Gauntlet was just Thanos' normal glove with the stones attached, so really his right hand should be sculpted like this, too, but by this point, people (that is, fans out here in the real world, not characters in the comics) think of the Gauntlet as looking one specific way, so we're not going to complain. 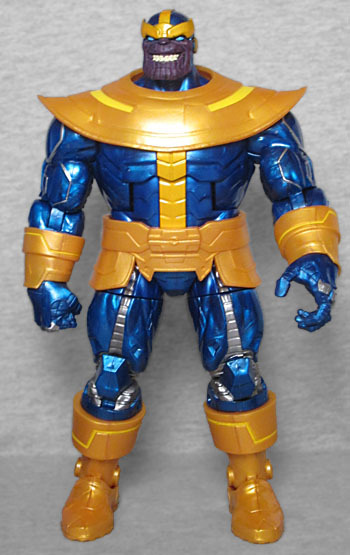 Thanos is sold in the same style of box as all the other Marvel Legends figures, but his has one interesting difference: the art on the sides of the packaging is full-color, a first for the line! When this type of packaging was introduced, the side-art was all monotone, and last year they started branching out to duotones, but this is the whole deal. 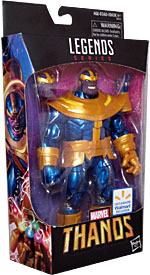 It makes sense (since that was the only way they'd be able to show the Infinity Gems in color, rather than playing favorites with one or two of them) and it really stands out on the shelves - where, since it's a Walmart exclusive, you'll either see forty dozen of him or zero of him, depending on your store. Fittingly, the logo on top of the box is the Gauntlet... but it's the wrong hand. It's a right, rather than a left. Whoops! The tray behind the figure is a purple starfield, which is a terrific backdrop for him. Even if you got the BAF version of the figure, the new frowny head and the inclusion of the Infinity Gauntlet make this an upgrade. This entry was posted in blog exclusive review, Hasbro, Marvel, Walmart and tagged Avengers. Bookmark the permalink.